Brown Thomas is one of the best known department stores in the country, the continent and beyond. First opened by Hugh Brown in 1848 and made a branch of Selfridges in 1919, it reopened as Brown Thomas in 1933 and continued its journey in fulfilling excellence, choice and great service throughout the 20th and 21st centuries. With stores in Dublin, Cork, Limerick and Galway and an amazing shopping experience online, you’ll find what you’re looking for, however you like to look for it. Fashion is something Brown Thomas does very well indeed, with everything from officewear to activewear, casual clothes to on-trend staples across its men’s, women’s and children’s range. Then there are the accessories and beauty products primed to complete your new look and the homeware items to make your home as practical and stylish as you are. We’re talking high performance kettles, juicers that’ll make your head spin and duvets to get lost in — everything you need to love your home again! How do I use my Brown Thomas promotional code? Sign up to Brown Thomas’s newsletter to hear about some brilliant offers! Where is my nearest Brown Thomas store? You can search for your nearest store on the homepage right here. Can I get a Brown Thomas loyalty card? Now you’re sucking diesel! It’s right here. Is there a Brown Thomas sale page? Yes, it’s right here and full of deals deals deals! You can return your Brown Thomas purchase within 14 days of receipt to receive a refund. Item must be in original conditions and packaging. Reseal your item, using the free postal return label on your package and send it back. Alternatively return it to store with proof of purchase. Sale items bought instore can only be exchanged and this must be done in-store. Full policy here. Brown Thomas is one of the country’s leading luxury department stores, with some of the world’s top designers jostling with homegrown talent amongst its pages. Whether you’re getting suited and booted for a big event or you’re just after something for a night out, chances are you’ll find it here. Shop with the Brown Thomas vouchers from vouchercloud and you’ll save a bundle on some beauty products, get a discount on a new dress or a saving on a suit. 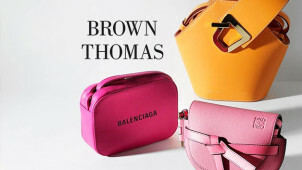 Brown Thomas is constantly holding events instore to help you get the most out of this forward thinking fashion brand. You could attend everything from a Vitamix demonstration, yoga classes, raw honey tasting, athleisure pop-ups and beyond. Now you can do more than just browse and click online; you can expand your knowledge in person, all the while interacting with like-minded fashionistas and luxury lifestyle fans like yourself. If you thought Brown Thomas was just about outfitting the ladies, you’d be wrong. Check out its menswear section where you could grab hold of everything from a sharp new suit to some cracking new work shoes and casualwear, all for less when you apply a Brown Thomas discount code from vouchercloud. After all, who says being a trendy fella should cost you the earth? From Gucci to Gant, Barbour to Burberry, your favourites are all here.